SharePoint Admin. SharePoint Guy. I have been working with SharePoint nonstop for the past nine years. In those nine years, I've done everything from 'normal' Admin work, development, migrations, training, planning, search, workflow, InfoPath, to crazy fixing of the hands-off SharePoint databases. I'm located in Austin, TX and can always help out with small projects. There might be a better way to get this done, but for now, this works for me. Keep in mind, this update works on a per view basis. If I find a way to correctly update the masterpage, I will update this post. At a high level, you will need to modify the page, add two content editor web parts, and save. Normal page displaying the Upload button and Drag files here to upload text. Start by editing the page. Top right of the screen, click the gear icon, then select Edit Page. Once in edit make, add two Content Editor web parts to the page. Place your cursor in the top web part, select Edit Source in the Format Text ribbon window. Once the web parts have been updated, click on Stop Editing. In the process of migrating from SharePoint 2010 to 2016 and ran into a small problem. When trying to get the email property from the SPUser class, it returned a value of domain\userName. Clearly, this is not correct and caused some other issues. Running this returned domain\yourNameHere, when it should have returned yourname@domain.com. Navigate to Central Admin, then cruise over to your User Profile Service. Once there, run a full synchronization. Run the PowerShell script again and it will return the correct data. Same idea as above but using the SharePoint ClientContext. I can never manage to remember how to do this. 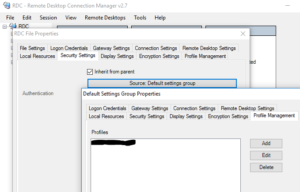 Simple enough, how do you update your login credentials in Remote Desktop Manager ( RDCMAN )? 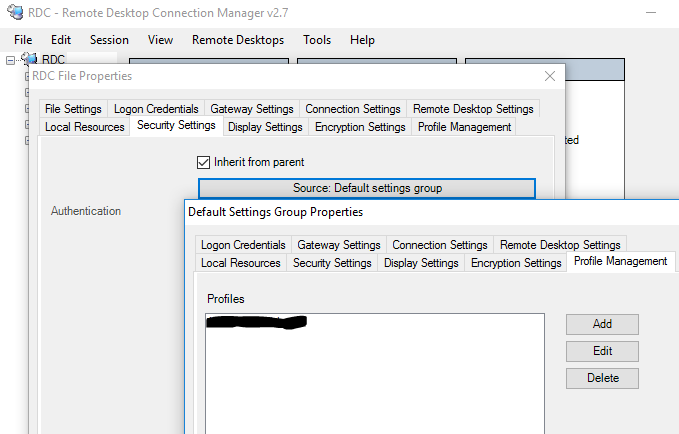 Select the Security Settings tab, then click on Source: default settings group. A new window will open, in it, select the Profile Management tab. Select the account you want to update, click the Edit button on right, then click Ok on the bottom. Enabled Hyper-V and tried to create a Server 2012 VM. Client window was black but the preview window was displaying the correct view of the client OS. The other fixes that appear on Google did not apply because I was in the process of setting up a new VM. With Hyper-V running and the client window open. IF you are not able to select this, click the Add button and locate it in the displayed list of programs. Now, close the Hyper-V client window and reopen it.